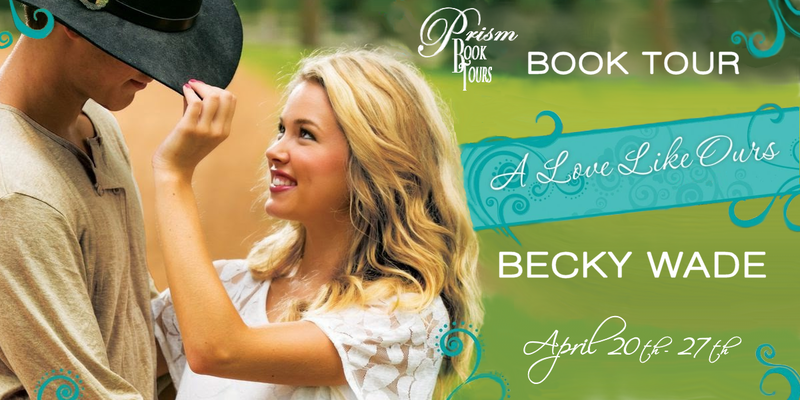 Welcome to my tour stop for Becky Wade's A LOVE LIKE OURS! Becky is one of my favorite authors and I really believe in what she is doing with this book: she's delving into a tough subject with PTSD and donating to the Intrepid Fallen Heroes Fund for books purchased anywhere by May 17th (more details on the Launch). As my part to this, I am giving away an additional copy of A Love Like Ours besides the tour giveaway, so make sure you enter both giveaways below. If you can't wait, go ahead and order your copy! He wore his gray knit shirt, the top three buttons open to reveal a downy white T-shirt beneath. His eyes looked bloodshot today and even more bleak than usual. He hadn’t shaved. Strain etched across his forehead and into the faint lines at the corners of his eyes. His hair showed tracks from where he’d shoved his fingers through it, probably in frustration. “Why aren’t you sleeping?” PTSD? Anxiety? What? Jake’s poor face. His poor, ravaged face, both undeniably handsome and unbearably exhausted. As big and strong as he was physically, he was also wounded. He needed someone to care about him. Following pure instinct, she stepped forward and reached up to place her hands on either side of his face. “No,” he rasped, trying to pull back. “Shh,” she replied, firm. She’d purposely placed her hands in the same position on both sides of his face, favoring neither the perfect side nor the scarred. His old injury felt the way it looked, thin and slightly stretched. His hands came up, banding around her wrists. He stopped short, though, of yanking down her arms. She could feel tremors going through him for the length of one breath, two. Exquisite lightning twined back and forth between them. She’d been motivated to put her hands on him out of compassion and determination. But now that they were bound together in this intimate position, the wild strength of their attraction leapt to life. Her heart began to drum. I love, love, love this author! I already have my copy of this book coming, so I'm not going to enter the giveaway, but I'll share it. Ahh! 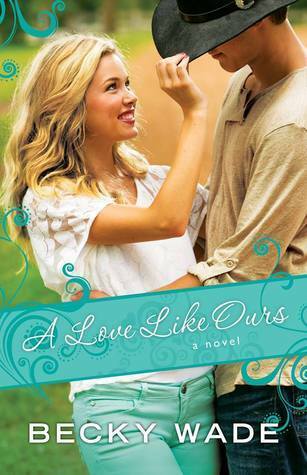 I was so excited already to read A Love Like Ours and now even more so after reading that excerpt!! I adore Becky Wade's books. :) Thanks for the giveaway! A few of my friends partners where in the army but I don't know any that have suffered PTSD. Thank you for the amazing giveaways!!! I do not know anyone who currently serves or who has suffered from PTSD. Yes, I know several. My brother for one, is still having a hard time. He was a POW. I also had a close friend , who suffered from PTSD, who committed suicide. I feel to many go without help or refuse help. Pray for them. Blessings & Thanks to all. I thought the excerpt was very touching! I haven't read anything from this author yet. I know people who have served, but no one with PTSD. My daughter suffers from PTSD but not from being in the military. My husband served during the Viet Nam era and thankfully he does not suffer from PTSD. this excerpt is pretty awesome. I'm looking forward to reading the book. i like the hint of the prior relationship between the two that is shown here. can the winner chose the amazon gift card for the amazon.ca site instead of the amazon.com site because the shipping for the amazon.ca site is cheaper if you live in canada. Wow, what a teaser! I'm currently reading the second book, Meant to be Mine, and loving it! I'm sure this book will be great as well. Thanks for the giveaway! I loved the excerpt! Thanks for posting! This sample really makes me want to read the book. Thanks for being part of the tour. the Amazon gc to shop and eat. A life changing exp. I don't think I know anyone with PTSD, but I did have a doctor ask me if I have it recently. Asked if there was any childhood trauma, had I been around bombs going off. Not sure what exactly he thinks it's like in WV, but it's definitely not that! I know a ton of people currently in the military or with honorable discharges. My high school was one that got a lot of military recruiters coming, multiple times during the year. A lot of kids signed up because of the temptation of travelling, or because they just didn't have a plan after school and this would be better than staying where we grew up (not many opportunities for employment within the county). My family's done a lot with the military, too. My grandpa was in the Navy, one of my uncles was in the Marines (I think that branch, rarely see him). My dad was Air Force. He told me sometime in high school that he wouldn't want his kids signing up. He's permanently disabled from moving around heavy bombs on his own; messed up his spine. I think he regretted not starting up at college at the "regular" age, too. I was probably 3ish when he started. And with all the trouble with VA, I think he just wanted us to avoid it. Bigger goals. I went to a top college for my field and double majored, then got employed by a tech giant (although I'm not able to work any more from disability myself). My younger brother is studying for a Master's in Medical Physics. I'd even had an Army recruiter call me back in HS to try to convince me to give them a chance. When I told him I planned to go to college, he asked for the name. I gave it. He asked for my entrance exam scores. Told him. "Wow, that's high, you must be too smart for the military." I appreciate the others that do go that route, even if I don't always necessarily believe that what's happening is right. Not like that's their fault; they're following orders. But the actions taken to protect the US and to help protect people in other countries who are being victimized...those are really admirable to me.